First, try to determine whether the animal is hurt or sick. Is the animal shivering, vomiting, or bleeding? Does the animal have an apparent broken limb or wing? Has it been attacked by a dog or cat? If the answer to any of these is yes, then the animal needs assistance. The best thing to do is to contact a licensed wildlife rehabilitator immediately. These experts care for injured, ill, and orphaned wild animals with the goal of releasing them back into their natural habitat. A nestling may fall or be blown or pushed out of the nest. Try to place the nestling back in the nest. Human scent on baby birds will NOT discourage parent birds from caring for their young. If the nest is out of reach, construct a makeshift nest out of a margarine dish with several holes punched in the bottom or use a small basket—straw, wicker, or the lattice type used for berries. Attach a wire or twine so that you can hang the basket from a tree branch. Pad the interior of the basket with soft, smooth cloth or paper toweling, place the nestling inside, tucking the feet under the body, and hang the basket as close to the original nest as possible. Watch for the return of the parents; if no parents return by dark, the nestling may be in trouble. Call a rehabilitator for advice. These young birds are learning to fly—a process that may take several days—and should be left alone to practice hopping and flying from low shrub branches to the ground and back. The parent birds should be within view of the fledgling; you may not see them, but you probably can hear them making sounds from a nearby tree. Rabbits are independent animals, not orphans, if they are more than four inches long and have full fur, open eyes, and erect ears. 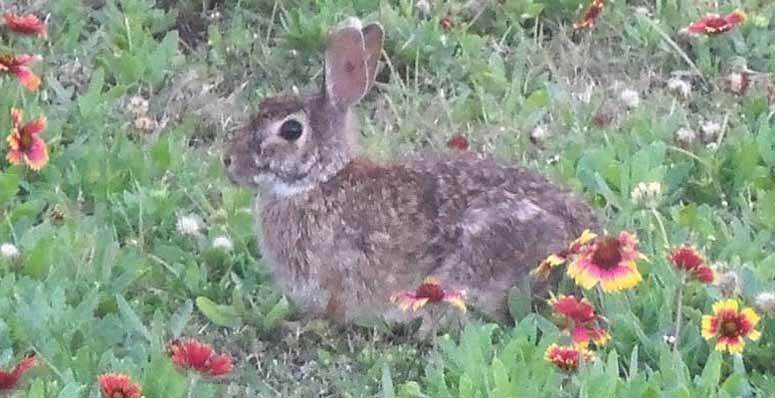 Rabbit nests are usually found in a shallow, furlined depression in the grass. If you come upon furless young who are out of the nest, return them to the nest. Reform the nest if it has been destroyed, cover the young rabbits with loose grass, and then mark the nest with an X using sticks or some natural-colored material, such as wool ribbon. Female rabbits only feed their babies at dawn and dusk, so you are unlikely to see the mother return. If she returns, she will move the marker when she enters the nest. If the marker remains undisturbed and the baby rabbits’ abdomens appear sunken the next day, then the mother has not returned to feed them, and you should contact a rehabilitator. Young rabbits easily succumb to stress, so you should handle them only as a last resort. Young deer are also left alone, usually hidden in tall grass, for long periods of time while the mother feeds. Unless the fawn looks injured, diseased, or dazed, leave the animal alone and vacate the area so that the mother will feel safe in returning. A baby squirrel on the ground probably needs help. If he is very small and has closed eyes, he is unable to climb or fend for himself. Place him in a box at the base of a tree and stay completely out of sight. The mother will usually retrieve her baby squirrel within a couple of hours. If she does not, call a rehabilitator for advice. Do not leave the squirrel out overnight. Older juveniles who are fully furred and climbing are capable of surviving on their own. If you determine that a wild animal needs assistance, a wildlife rehabilitator is the best person to call. A rehabilitator can explain what to do to keep the animal safe, quiet, warm, and protected until you can get the appropriate help. It’s important to keep cats, dogs, and children away from the animal while determining if the animal needs help or remains in the area. Dogs and cats are natural predators, so it’s up to you to make sure they can’t harm newborn wildlife. Never attempt to rehabilitate a wild animal yourself. They have very specific needs, and the care that would nurse a human or domestic animal back to health could harm a wild animal. Plus, in most states it’s against the law to keep wild animals unless you have permits to do so, even if you plan to release the animal. Department of Natural Resources, 1-877-463-6497 (Hours: 8:00 a.m. to 5 p.m.) DNR also can help you locate a wildlife rehabilitator. Prince George’s Animal Management Division, 301-780-7200. SPCA/Humane Society of Prince George’s County, 301-262-5625 (press one for emergencies).